The fish is very useful to use every day. 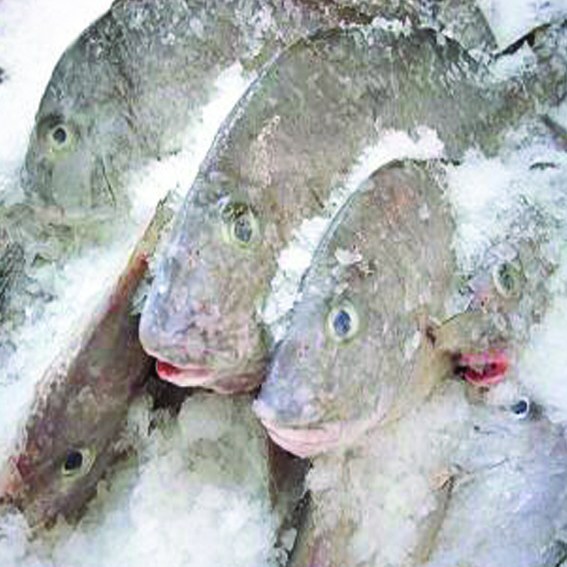 Frozen fish can be cooked in different ways: boil, bake, fry, stew, braise, bake on the grill. As a side dish suitable vegetables and rice. Potatoes and carrots boil "in uniform". Defrost the fish, clean it from scales, remove the entrails, cut off the fins. Cut the head and tail. Rinse under running water. Two onions onions cut into rings, and the third an onion – feathers. Onion, chopped feathers, put in a bowl, add salt and pour the Apple cider vinegar. Boiled-smoked pork belly, cut in half. Cut the peel from one half and thinly slice plates. The second cut in the form of "scallop". "Scallops", fry on a dry pan. The fat pour in the dish with refractory oblong high edges. Half an onion cut into rings, put on the bottom of the dish. Two slices of bacon put in the middle. Fish RUB with salt inside and put half the bunch of dill. Make six deep diagonal cuts approximately 2/3 of the thickness of the fish. RUB the fish with salt in the places of incision and put it in the dish. The cuts of fish place slices of bacon without skin and fat side out to the same place at the ringlet of onions. Carrots and potatoes "in uniform" clean and cut into slices. Around the fish put in the form of "scales" mug chopped carrots and potatoes, between a layer of carrots and potatoes, put the separate onion rings, the layers are separated, each layer of salt. Potatoes fried "scallops" and onions, soaked in vinegar, put on top of the fish. Sprinkle paprika powder, pour sour cream, put sprigs of cherry for decoration. Leave for ten minutes to soak up the sour cream, then put in a preheated to two hundred degrees oven for half an hour. To easily clean the fish, rinse it with hot water from the tap. If you cook fish without potatoes, the baking time is reduced to forty minutes.